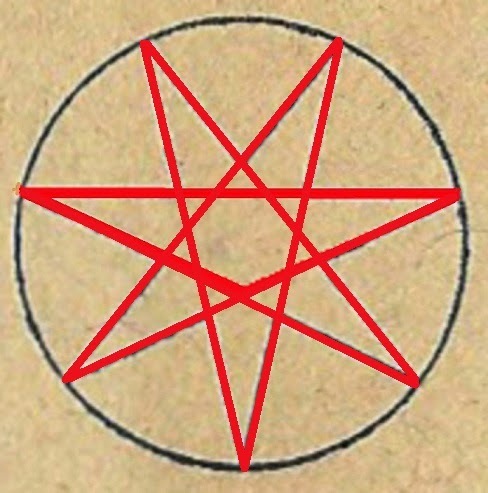 The seven pointed star is the geometric matrix at the centre of the Sacred and Profane Love. A line a-b drawn between the rider on horseback (racing toward the fortress at the viewers left) and concluding at the position of the shepherd guarding his herd to the right of the picture, announce the presence of Mercury/Hermes. Mercury was well known as the 'patron of travellers and shepherds' (see J. Lempriere, Mercurius p. 364) and the line a-b transcribes that fact. Fig. 1. The line a-b runs across the forehead of the child at the fountain announces Mercury/Hermes. 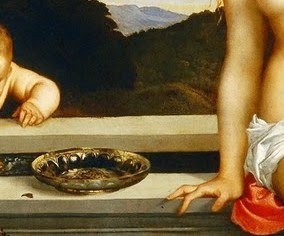 The child of the Sacred and Profane Love appears at first glance to be Cupid, but the Sacred and Profane Love's visual narratives are similar to that form of transformative storytelling presented by Ovid in The Metamorphoses. Ovid's single epic poem links a series of self contained transforming narratives and stories containing stories which flow toward an ultimate unity as the body of work (the book). While the Sacred and Profane Love participates in the transformative genre of Ovid, individual arguments are expressed through a series of visual metamorphoses which reveal concise arrangements of narrative sequences as clues to the whole and in doing so the Sacred and Profane Love develops its own artistic edifice by embedding constructive patterns and reproducing specific meaning through geometry, symbolic reproduction of narrative. 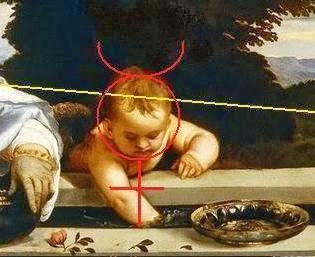 For example; the child is nearest to the clothed figure at the viewer's left suggests that this arrangement is mother/child and might represent Venus/Cupid - as Cupid is traditionally the offspring of Venus. Reading proximity in this manner in this example is actually correct. But both figures evolve according to a visually prescribed narrative. Through this process of metamorphosis (visual contextualisation) Venus will become Proserpine and Cupid will metamorphose into Mercurius/Hermes; Mercury (psychopomp); and later Mercury (the element). To this also we find the geometry reads as a type of structural logic which binds these narratives to specific visual sequences. The prescence of Mercury/Hermes unequivocally states that rather than Christian or Neoplatonic this work is is alchemical in intent and this is seen in the colour of the women's clothing. The colours ascribed to Proserpine (Venere vulgare) are white with a flash of red while her mother Ceres (Venere celeste) presents dominately red but with a flash of white (across her loins). These colours (combined with the presence of Mercury) tell the viewer that the sulfurs are in the process of being mixed (the mixt) in the fountain (the Athanor) and so indicates that the Great Work has begun (the psycho/physical chymical process of Alchemy). This Sacred and Profane Love was clearly commissioned for a male who, as the groom in this Chymical Wedding, is also the viewer who in understanding should assume the role of Pluto who is philosophically very present and yet invisible. 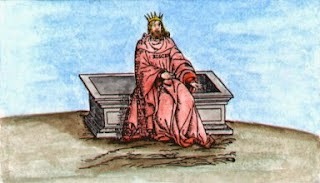 As the fountain/Athanor is also the doorway to Hades (and mythologically known as the Fountain Cyane) the groom (as the male principle) must be present to facillitate the alchemical process which, by the obvious mixing of red and white between the women shows that he - Pluto (male principle/groom) - is present within the process. Fig. 2. The line across the forehead of the child refers to the Temple of Hermes. This a-b line is the prime key within the paintings design because of three main points. The first is that the line a-b introduces not only Mercurius/Hermes, but this line as a key suggests further geometric schema within the paintings structure - and this is proved to be so. Fig 3.The line drawn between the spigot and the Rider on Horseback. The second point is that the traveller on horseback will become the limit or boundary of a circle (see fig.3) whose central point or apex will be positioned at the mouth of the spigot at the front of the sarcophagus/fountain. Fig. 4. The scalene triangle a-b-c. The third point is that by drawing a line from the mouth of the spigot to the shepherd completes the form of a scalene triangle i.e., a triangle of three unequal sides. This triangle is defined by the line a-b; b-c & c-a. The central junction of the scalene triangle is also found at the mouth of the spigot. But it is the line between Traveller and the Shepherd (a-c) that sets the boundary for the circles circumference. and also indicates the alchemical influence invested into the paintings narrative and structure. This circle will contain all of the information necessary to understand the meaning of the Sacred and Profane Love. 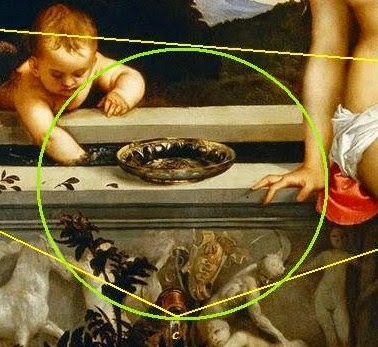 As discussed in the last post (on the meaning of the murals on the Fondaco dei Tedeschi in Venice) the winged child Mercury/Hermes held a wand (the caduceus) to identify him, while here at the sarcophagus/fountain is found the same unusual motif of a winged Mercury and should therefore should be recognised as being in proximity to the oeuvre of Giorgione. "...Water of Art... Divine Water, Fountain Water, Purifying Water... Bath... Moon...Lunar Matter...Mother, Crude Mercury...Woman, Sea... Sepulchre... Vase, Philosophers Vase...". Pernety, p.154. 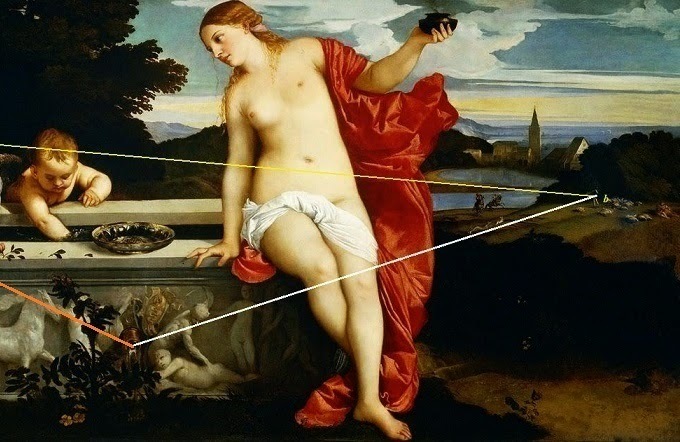 In regard to the identities of Proserpine & Ceres, the colour of the women's clothing as presented in the Sacred and Profane Love refer to the mixing of the sulfurs; this is to say that as the arm of mercury stirs the 'mercurial waters', the sulfurs within the athanor are mixed. Those sulfurs are called white sulfur and red sulfur. Looking to the Sacred and Profane Love, Proserpine wears white with a dash of red, while Ceres wears red with a dash of white (she is actually surrounded by a red fabric) - but this indicates that the all important mixing of the sulfurs or the stirring of the mixt has begun. This athanor (the sarcophagus/fountain on which the two women are seated) is on every level, the matrix of the alchemical operation. and which in the Sacred and Profane Love is surrounded by the four elements. Below the Sarcophagus/fountain is Fire: and to the viewers left - Earth. Above the figure of Ceres - Air; and to the left of Ceres, in the upper left quadrant, coves are present at the base of a mountain range - Water. So, to the left of the painting is represented Earth and Fire, and to the right; Air and Water. The myth of Proserpine occurs in Sicily, the location of the volcano Mt Etna, and the Fountain Cyane is a spring fed waterway also found on the Island. The radiance from Pluto's infernal regions heats the mercurial waters in the Bain Marie or the Bath of Mary also called the athanor and/or 'the vase of the philosophers...". The Sarcophagus/Fountain of the Sacred and Profane Love is the Fountain Cyane that was formed by Pluto striking the ground with his trident to expedite his escape with the abducted Proserpine. The Fountain Cyane & the sarcophagus/fountain of the Sacred and Profane Love intend to represent the doorway to Hades, which is guarded by the three-headed hound Cerberus who is positioned at the the entrance to prevent the living from entering and the dead from leaving. This aspect explains the form of the sarcophagus/fountain (the Fountain Cyane as the entrance to Hades) at which doorway Mercury has metamorphosed again (albeit for the last time) as Psychopomp. Fig. 8. The Resurrection (revivification). From the beginnings as the "Philosophical Night" (Pernety, p.34) which heralds one of the first processes of transformation - to the final Resurrection (of the incorruptible body), the Sacred and Profane Love encompasses a conceptual didactism that would have been intended as an instructional reference for a House that considered such knowledge as valuable to their family status as wealth or power might be. Therefore as product of its time the Sacred and Profane Love encapsulates a type of cultural elitism, albeit somewhat clandestine, but this knowledge is cultural wealth and not necessarily attainable by - or related to - personal wealth. A great deal of this information has been delivered by someone who knows - and that someone is most likely Giorgione. Perhaps the best title for this painting would be Philosophical Night or simply Night, and on that note the request of Isabella d'Este springs to the foreground again. Alchemically and structurally the Sacred and Profane Love participates in an ancient Italian lineage which will in time be seen as a prime example of the Renaissance quest of recovery and rebirth - if not the pictorial epitome of that ambition unconfined by the limitations imposed by the Venetian state* or the Holy Roman Church. Even so, while the Sacred and Profane Love touches upon alchemy, it is not strictly speaking a dedicated alchemical treatise. Rather it is in nature philosophically Hermetic, and here we see the continual play with metamorphosing narratives and a breadth ranging between earth and cosmos. It should be recalled that the State of Venice had outlawed Alchemical works in 1488 - a decree endorsed by the Venetian Council of Ten. Nicolo Aurelio, the man whose coat~of~arms features on the escutcheon on the sarcophagus/fountain was later to become one of four secretaries. So it is somewhat ironic (or even downright odd) that Niccolo Aurelio is conjectured to have surreptitiously commissioned this alchemically themed painting to chance being exposed through such an extraordinary risk taking venture - particularly after his bride-to-be had witnessed the hanging execution of her father for supposed treason against the Venetian state. 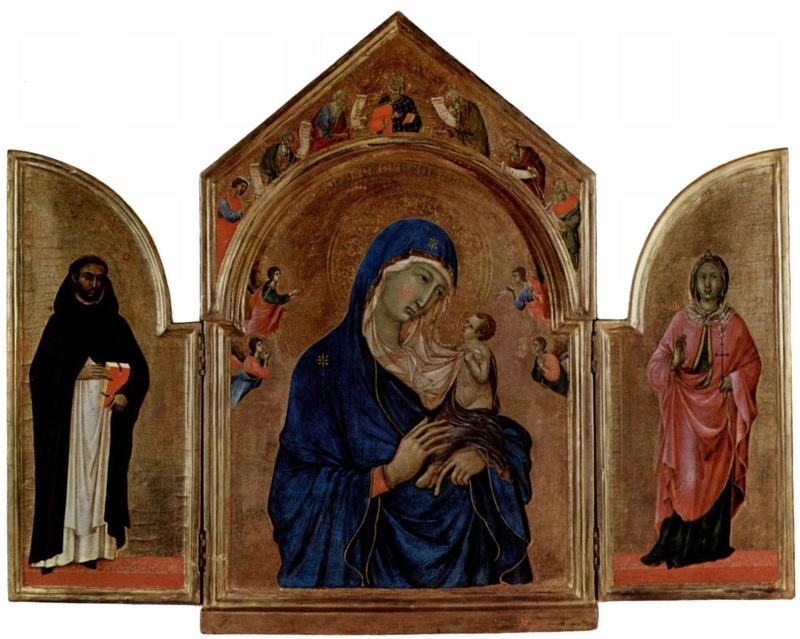 Duccio's triple panel is - according to K. D. De Haas , based on the geometric principle of hepta-angles 'divided into seven equal arcs'(p.4). 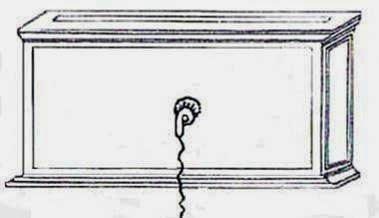 Fig.11. The heptagram and the proportions atop the centre panel of the triptych. 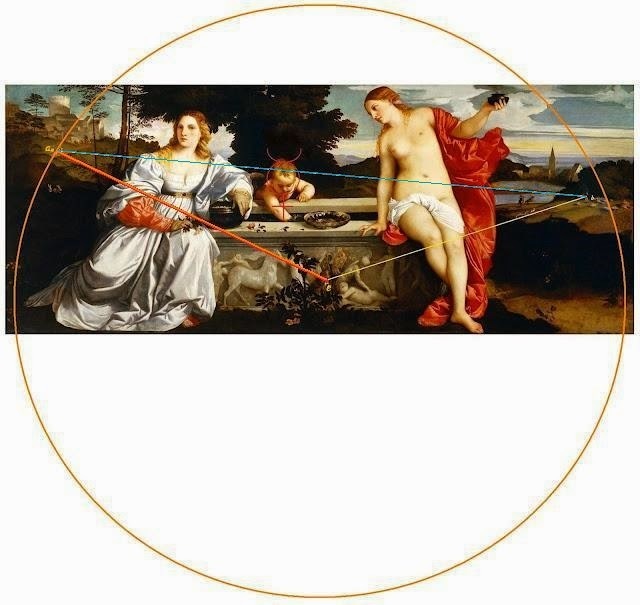 K. D. De Haas was the author of two memorandums discussing esoteric geometry in art, and notes the seven figures in the upper central panel, locates the radius of an implied circle and divides this into seven equal arcs. Using this logic De Haas claims that Duccio has placed a heptagram that can be known. 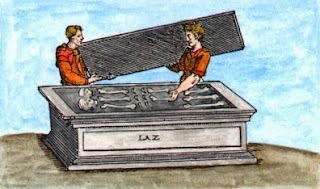 As stated by De Haas, the hepta-angle appears to have been employed as an act of consecration according to the mystical beliefs of the power of the number seven. All number symbolism appears to be a devotional, theurgical operation. In Duccio's Maestà (c.1308-11) the original inscription stated: HOLY MOTHER OF GOD BESTOW PEACE ON SIENA AND SALVATION ON DUCCIO WHO PAINTED THEE. The inclusion of number symbolism or the hepta-angle in a work of art should be considered a sincere supplication - generally hidden - and which as a silent prayer represents a theurgical investment into the work. The scalene triangle (a triangle of three unequal sides) offers the same three options as any other triangle, and that is that each line forming the triangle has line, conjunction, area, and (if it is actually there) a schematic reason for its existence. Inversely, there should be a visual link or clue to verify its existence rationally and logically. After finding the identity of Mercury/Hermes using the single line (refer to Fig 1), the next stage is to use the mouth of the spigot (c) as a diverging point for the two lines c-a and c-b which will produce a three sided triangle (Fig. 12). Fig. 12. The unequal 3-sided triangle a-b-c. But because the triangle found in the Sacred and Profane Love is uneven (the line c-b is shorter than its opposite line c-a), see Fig. 12 - it cannot belong to Duccio's hepta division because the two shorter sides of each 3 sided triangle must be of equal length to form the 7-pointed star (refer to Fig. 9). To remedy this the author of the Sacred and Profane Love's programme has left two clues; the first of which is the dog chasing the hare in the right mid-ground - just below the two men on horseback. Fig. 13. The angle of the white line (c-b) confirmed by the hound chasing the hare. In Fig 13, the hound and hare run along the shorter line (c-b) which forms a direct line from the centre of the spigot to the shepherd. The angle of the line is specific; that is; it could not be directed to any other icons within that vicinity but more importantly the hound and hare confirm this line (and its angle) to be a deliberate line. This reveals the sole purpose of the hound and hare which is to reward the inquiry with the final line of the scalene triangle. The road and the circle. Fig. 14. (Detail) The curved track near the right arm of Ceres. The second clue is the tightly curved rustic track that disappears quickly near the resting right arm of Ceres (see Fig 14). Together, the line c-b and the curved track will advance the scheme to a new level. By following the progression of the images below, syncretic schema geometrically harmonises key pieces of visual information to include this small track. Fig. 15. (Detail). The curved road . Fig. 16. The 3-sided triangle and the curved road next to the arm of Ceres. Fig. 17. Triangle and circle (Stage1). 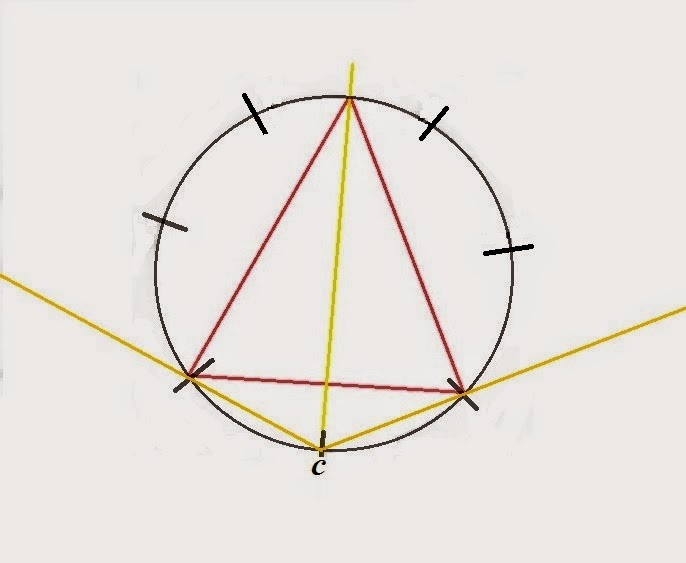 By placing a circle bounded at the top by the line a-b, and at the lower extreme by the apex at the spigot (c), the form of the road begins to make geometric sense and the overall scheme is seen to participate critically in the paintings meta-narrative: This circle actually contains the true Hepta-angle. Fig. 18. Triangle within the circle. In fig. 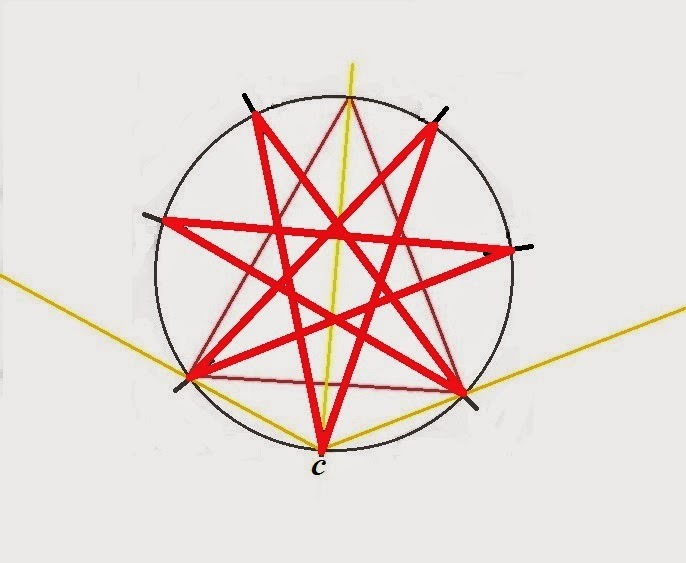 18, the (red) triangles base is determined by the circle intersecting the lines a-c & c- b. By using the base of the triangle to mark the seven points of a hepta-star the hepta geometry is revealed. Where Duccio may have been considering the seven days of creation in the construction of his Triptych, the Alchemico/Hermetic context of the Sacred and Profane Love would most likely refer to the seven planets of alchemy: Saturn; Jupiter; Mars; Sun; Venus; Mercury; Moon. Whether a geometric hepta reference was intended as a form of devotional Christianity in the sense in which Duccio would have intended or as an alchemical reference, the fact is that this geometry exists and was as much a part of the paintings intended meaning as any aspect of the figurative display. Either way, the presence of the Heptagram is definitely a talisman and indicates a theurgical attitude toward the intention of the painting and further defines the creative process as being far more than just a beautiful image. Like the ouroboros the use of geometry returns to a methodology of much earlier traditions; of Duccio and no doubt other painters whose belief in the gospel of geometry and the sanctity of number symbolism. According to K. D. de Haas, hepta angles are present in the works of di Fredi; Cimabue; Memling; Fra Angelico (several works); Penicaud I; Van Der Weyden and of course, Duccio, and now the collaboration which is the Sacred and Profane Love must be added to the inventory of de Haas. While the geometry of perspective schema rules Italy, the Sacred and Profane Love returns to an earlier time when symbolic geometry satiated the expressive appetite of the artist. The circle is complete. 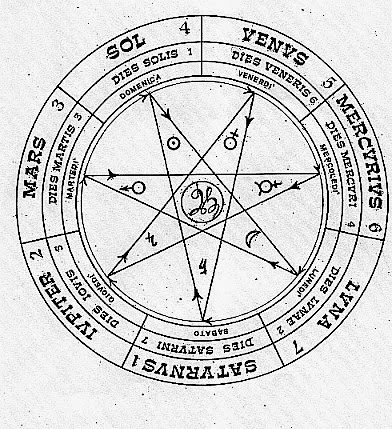 To conclude: Because the circle within the scalene triangle is indicated by the small, unusual and otherwise pictorially unnecessary track near to the right hand of Ceres; because the hound chasing the hare conforms to the line between spigot and shepherd; because the line between shepherd and rider on horseback conforms to the statement 'Mercury is the patron of travellers and shepherds'; because the position of rider on horseback and the spigot scribes a circle within which the zodiac and star map can be located; - to assume all of all this to be chance - can only be the viewpoint of a fool. At this time appeared a man who is still living and endowed with mighty power; his name is Jesus Christ. His disciples call him the Son of God; others regard him as a powerful prophet. He raises the dead to life, and heals the sick of every description of infirmity and disease. This man is of lofty stature, and well proportioned; his countenance severe and virtuous, so that he inspires beholders with feelings both of fear and love. The hair on his head is of the colour of wine, and from the top of the head to the ears straight and without radiance, but it descends from the ears to the shoulders in shining curls. From the shoulders the hair flows down the back, divided into two portions, after the manner of the Nazarenes; his forehead is clear and without wrinkle, his face free from blemish, and slightly tinged with red, his physiognomy noble and gracious. The nose and mouth faultless. His beard is abundant, the same colour as the hair, and forked. His eyes blue and very brilliant. In reproving or censuring he is awe inspiring; in exhorting and teaching, his speech is gentle and caressing. His countenance is marvellous in seriousness and grace. He has never once been seen to laugh; but many have seen him weep. He is slender in person, his hands are straight and long, his arms beautiful. Grave and solemn in his discourse, his language is simple and quiet. He is in appearance the most beautiful of the children of men." Antoine-Joseph Pernety. The Great Art, Originally published c.1758. Reprint: New York 1973 Samuel Weiser, Inc.
* See Dr Martin Luther King's essay: (Link) "The Influence of the Mystery Religions on Christianity". This post will be revised when the moments strike and is copyrighted and not to be used without permission.